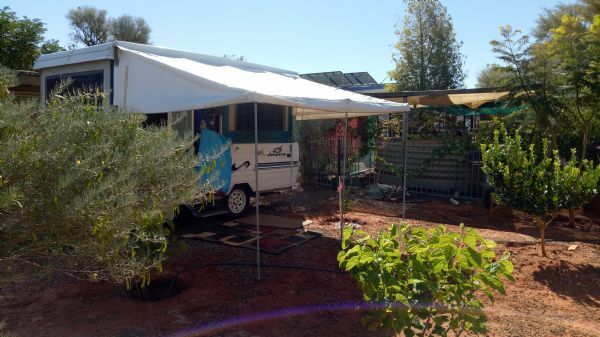 We camped at Eatons Hill (Brisbane), Buderim, 1770, Yeppoon, Mackay, Airlie Beach, Townsville, Hughenden, Mount Isa, Barkly Homestead, Devils Marbles Hotel, Alice Springs, Uluru, Coober Pedy, Port Augusta, Adelaide, Renmark, Mildura, Echuca, Mulwala and Bathurst. This photo was taken at Mulwala. It was raining and the Lake had been lowered 4.5 metres! Now, all I have to do is find time to finish them! 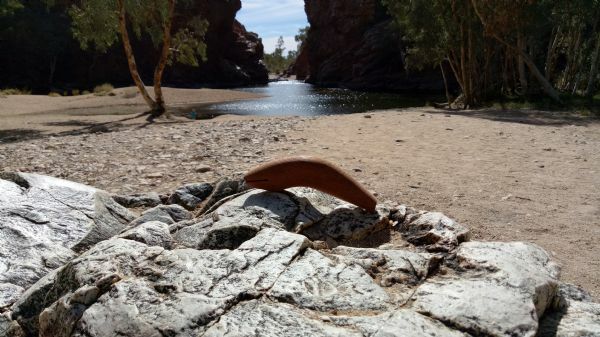 I saved the Mega Booma for a 'symbolic' carve in Alice Springs. 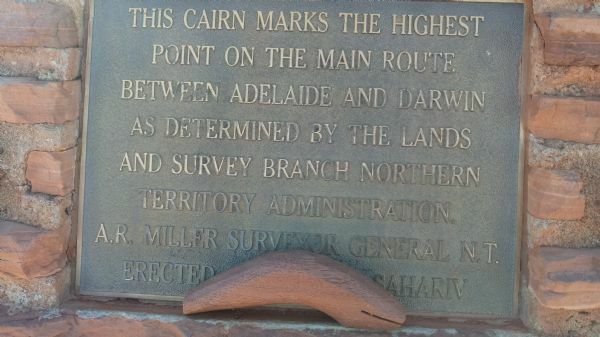 The red cedar representing the Red Centre and the Booma shape to represent the local aboriginals. That big blank went on a lot of tourist drives with us and was happy to have his photo taken. 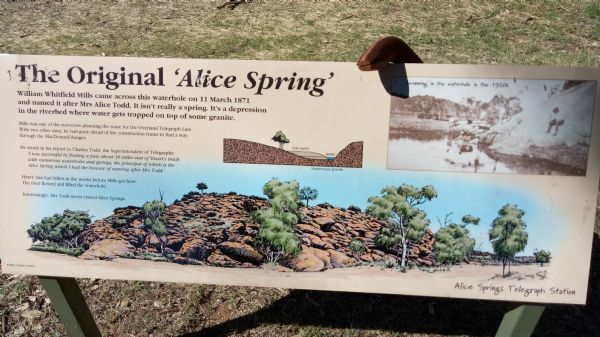 The accommodation at Alice Springs was a bit rough. 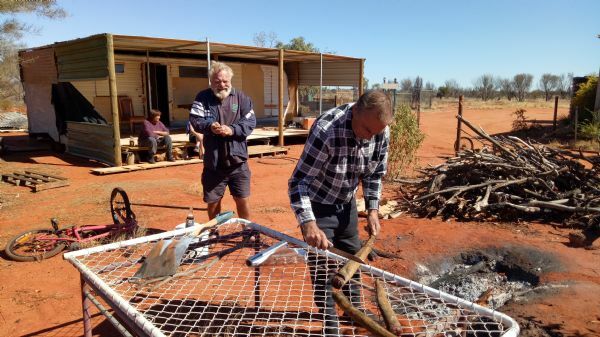 Stayed with my brother about 20 km north of the Alice. First meal was Kangaroo tails. Had to get up at 6.30 each morning to light the Donkey Heater, so we had hot water. A real education! John, we stole the father-in-law's little Jayco Penguin and did our very first trip in a van. 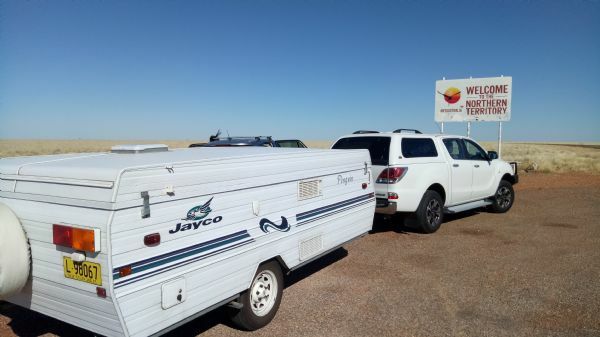 Both, BT50 and the Jayco had an event free trip. We had a great 7 weeks away, ticking off the bucket list as we went. That would be a awesome trip enjoy!! Wow, you covered some miles. Looks like a great trip. Good to see you made it home safe & well Travers. It was great to have you & Robyn over to meet some of our Townsville lure nuts and it was a shame we couldn't manage to get you connected to a barra. 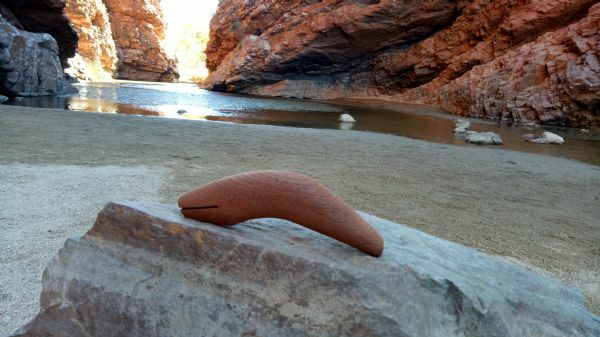 The Biggera Digger that I carved at Yulara, managed a few photo shoots around Uluru and the Olgas. Just unfortunate that we struck Lake Mulwala at low tide! We knew that they were dropping the water level by 3.5 metres, to kill aquatic weeds, but they decided to let an extra metre of water out just before we arrived. We launched Rocco's boat below the weir but the water was freezing!! The Cod weren't happy and didn't play. 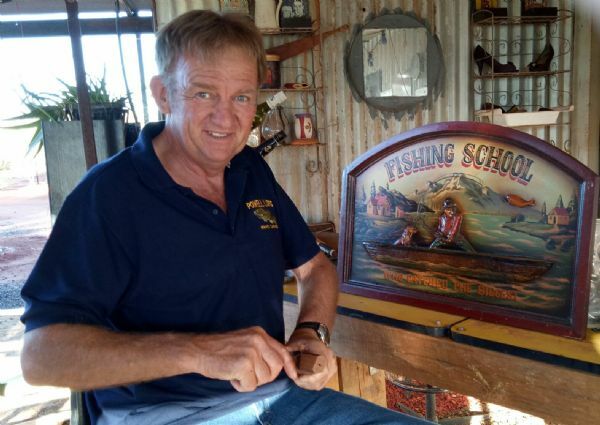 Rocco and I had planned a fishing trip to Mulwala about 4 years ago. We finally executed the plan, but our timing was poor! Thanks, Darren. Would have been great to catch up, while we were in Mackay, but you were too far away! It was great to catch up with a few of the crew in Townsville. Just got home after visiting Adelaide, bloody freezing and windy. Note to self, 'never go south of the Tropic of Capricorn again in winter'. Wife and I both had flu shots, both have the flu. Bit of R&R in Darwin will fix us. Sounds like you had a good trip Travers, good for you. Told you to turn right at the 'Threeways' Travers, those Qlders. are hopeless. Me and Toby Hewitt would have got you a big Adelaide R. barra. Toby smashed it this runoff. Next time? Great trip, I love the story and the pics and how you managed to see other Lure Lovers along the way is gold. 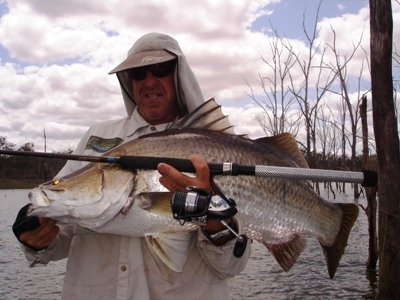 Pity about Mulwalla, its good to see Travers that you still make sensational looking lures..
Nice photos Travers. 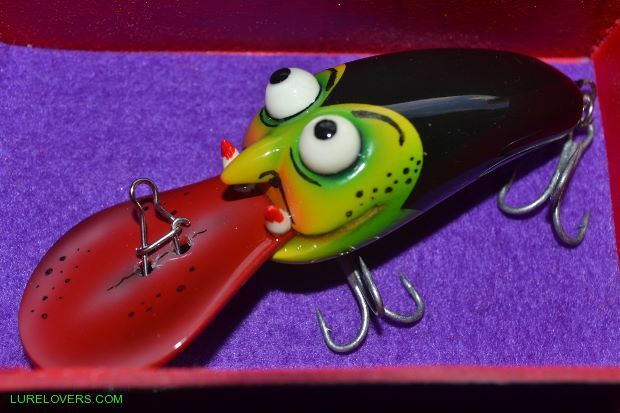 Lures with a traveling story before they are finished. Most get the traveling story after their finished. They've done some miles.